00:33 hisforever How do I craft brass? 00:49 hisforever What do I put together to craft brass? 01:33 Vault how are you on Win2000?! 01:34 agrecascino it was the os i had on my other hard disk? 04:00 segfault22 is it a good idea to store the server files on an older disk, then backup every day to a newer disk of the same capacity? 04:02 segfault22 just fine; how are you? 04:22 cheapie Hmm... so, with the mesecons split out of the base "mesecons" mod into another mod in the modpack, would it make more sense to call that "mesecons_wires", "mesecons_mesecons", or something else? 04:23 cheapie They're usually called "mesecons", but that causes ambiguity in a lot of situations and "mesecons_mesecons" sounds odd to me. On the other hand, "mesecons_wires" isn't great either since they're almost never referred to as "wires". 04:34 cheapie Well, VanessaE suggested "mesecons_conductors"... I think I'll go with that. Shouldn't be too hard to rename it if necessary. 04:38 segfault22 or maybe a magnetic induction power system, like "magnetricity"
04:41 segfault22 is magnetricity better than electricity, since technic already implements a subspace-grouund/return single-wire electricity system? 04:46 segfault22 or how about we just steal an idea from Thermal Expansion mod and call it "flux" or "RF"
04:52 agaran well idea like segfault mentioned exists, Megaf started to ponder about that..
04:52 agaran I fiddle a bit about own cabling for technic too but thats slowly going..
05:04 Chinchou It reminded me of Tesla's coil systems- oh, segfault left. 10:15 Calinou I typed ".orpg" instead of ".org"
11:21 eliotJ I creative mode all nodes, tools, etc. are endless, right ? 11:32 eliotJ For ride by railways do I need some "train" ? 11:40 eliotJ Calinou: Why does not simply doc 97 ? 13:09 eliotJ Where does most complete wiki for Minetest ? Minetest.net or Minetest.com ? 13:53 Fixer_ sfan5: why on earth someone needs old minetest.com? 14:02 Fixer_ but why no utf8 errors? 14:41 sfan5 did the version from "a few months ago" even check how long ABMs take? 14:43 IhrFussel sfan5, no the 0.4.13-dev build seemed to not report these ABM times so I'm guessing you guys changed the error level of those...but my server didn't lag a few months ago and if the ABM times don't cause the lag of up to 10 seconds what else? 14:46 eliotJ Does it's possible to force in GUI only "creative mode" (locking these option - user can't change it) ? 14:50 agaran we had problems with some software that was writing fast enough to not let machine catch up with journaling updating..
14:57 agaran sure, hmm, checking on new empty world with same modset may be interesting.. but that will scary players..
14:58 agaran IhrFussel: there are at least few things that happen like that, map generation when one gets to new block that wasn't generated yet, some heavy abm trigger peak may occur..
15:00 IhrFussel Well I increased the ABM intervals of all mods (even defaults) maybe I need to increase the chance too? 15:00 agaran yes I know you did, but that does not prevent group of ABMs from occuring in short amount of time..
15:01 agaran depends for what item..
15:02 agaran what I'd like would be reducing from what distance you see other player tags.. to like 100 nodes or so..
15:03 agaran IhrFussel: lag 10..
15:04 agaran Fixer_: well I did not say it is ABM, just noted that now it is 10..
15:05 IhrFussel How do I enable it again? 15:07 IhrFussel Will it create the file automatically? 15:15 IhrFussel Fixer_, chatcommands.lua on github doesn't state a /profile or /profiler command...is it builtin c++? 15:30 Fixer_ IhrFussel: are you using darkage mod? 15:31 agaran Fixer_: whats wrong with darkage mod? 15:46 agaran probably then I did not notice..
16:04 agaran true but seems ppl make >1 character to bypass that to some degree? 16:06 agaran IhrFussel: I am just guessing by 'same ip' before..
16:06 agaran i rather try to avoid reading chat.. I feel too old for that..
16:25 Krock is the oil extract usable as fuel? 16:30 agaran IhrFussel: How many 'Audie*' you saw so far? 16:52 agaran IhrFussel: did server crash? 18:04 Hijiri Calinou: can I get a wiki/dev wiki account? 18:15 IhrFussel Okay I have the txt file now with the results...do I upload it somewhere like pastebin? 18:16 kaen is there a lua pathinder implementation in use yet? 18:16 eliotJ agaran: Are you here still ? 18:25 kaen related question: is there another minetest-like voxel engine available with... a better api for making games? I've already had to re-implement physics, persistent entities, and map data access in lua. I'm about try reimplementing pathing as well. I'm actually specifically trying *not* to write an engine but I'm already like 20% of the way down that road. 18:32 IhrFussel agaran, what do I do with the profiling results now? Any clue? 18:33 agaran meh, not I have only 0.4.14-stable, so no new profiler..
18:34 eliotJ agaran: Did you chek if these permament hide or locked of "damage" and "creative mode" are possible ? 18:39 eliotJ agaran: Do you mean in the "Minetest/minetest.conf" ? 18:42 agaran this should do job..
18:43 eliotJ <agaran> I have idea, you can grant 'creative' privilege to every player (default privs or sth like that) <- Eeee... How ? 18:44 agaran or maybe without say..
18:45 eliotJ agaran: I read somwhere fly and fast run needs special privilage... If do I put there "fly" it also allow fly ? 18:50 rubenwardy also, what do you mean by persistent simulation? 18:50 agaran hmm I haven't been playing with that.. but when I need privs I added that by hand..
18:53 eliotJ agaran: Btw. If I need fresh conf I should simply delete this "Minetest/minetest.conf" and games will automatically create new, default one, right ? 18:58 agaran maybe that setting is taken from config only for server..
18:59 agaran hmm... then maybe bug is that it does not load it from config.. but overwrites.. but.. I think you can make icon that just run singlemode with provided custom.conf without asking..
19:02 eliotJ agaran: "I think you can make icon that just run singlemode with provided custom.conf without asking.." <- Hmmm... But that way do I still can select a diffrent world to be generated ? 19:03 eliotJ agaran: Does it's metod of redesigning these GUI ? 19:05 agaran yes, as far as I know some of that is lua defined..
19:13 agaran anyone can tell me off head where I shall look to add block to circular saw? 19:42 eliotJ agaran: I find a file "tab_singleplayer.lua"
20:14 eliotJ Btw. does it's possible to construct some machines directly in Minetest, like it's possible in Minecraft ? 20:18 eliotJ agaran: You mean I need some mod, right ? 20:29 eliotJ --"checkbox[0.25,0.25;cb_creative_mode;".. fgettext("Creative Mode") .. ";" ..
20:29 eliotJ agaran: --"checkbox[0.25,0.7;cb_enable_damage;".. fgettext("Enable Damage") .. ";" ..
20:31 eliotJ agaran: These 2 buttons disappered what I want for my kids... But There are really gone there or just are invisible and clickable by accident ? 20:31 eliotJ agaran: Should I commenting more ? 20:32 eliotJ agaran: Btw. Do you a dev of a minetest ? 20:34 eliotJ But do you know programming ? 21:14 Megaf so, who was making that nice texture again packa gain? 21:32 Megaf wow, amazing it looks! 21:32 agaran Megaf: one person was asking about concept similar to yours wiring idea.. maybe time to post on forums? 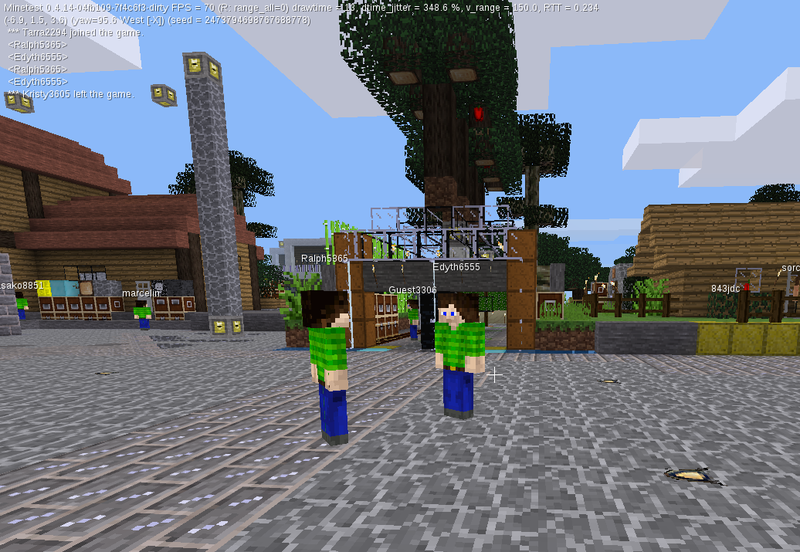 21:33 agaran I did not remember link for it..
21:51 Megaf Calinou: no texture for sapling? 23:11 hisforever Hi I have the yellow super Glowlight I need the pure white ones how do I craft them? 23:16 Jordach did i miss anything? 23:30 Anonyma And I use 3ds max 2014, you see. 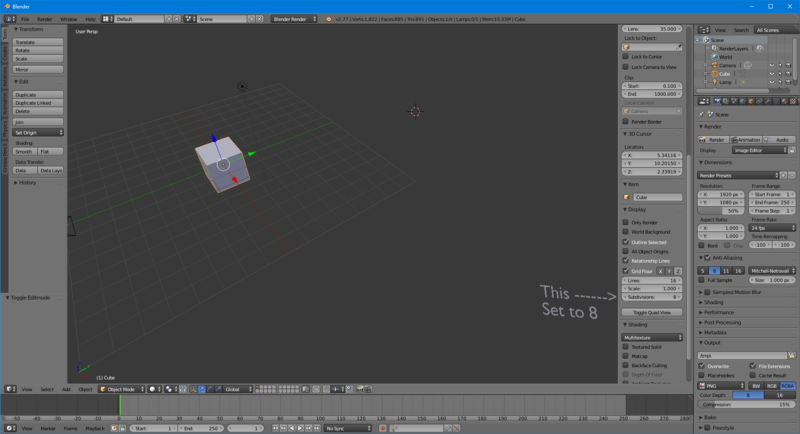 And that adds another layer of difficulty because I'm not quite able to open .x OR .b3d files, even by importing. 23:31 Anonyma Well, what about .x? 23:33 Anonyma hm, what about milkshape and quake models? 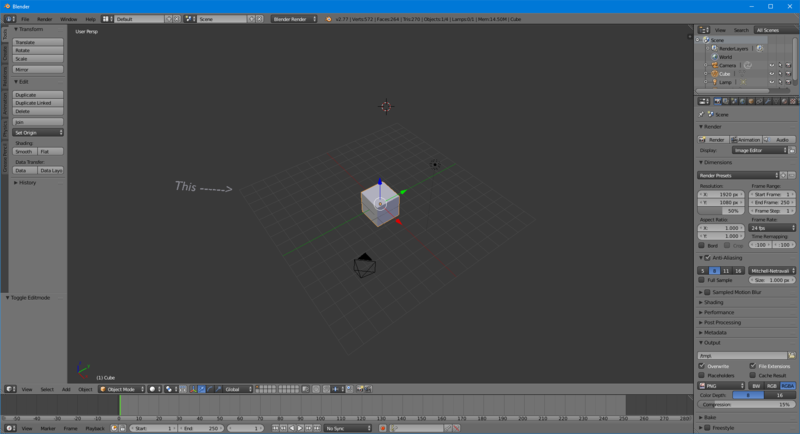 23:35 Anonyma Is that the only way to get a working model, or does blender support .b3d natively? 23:43 Anonyma Now how would I go about getting a reference model for scale? 23:48 Jordach Anonyma, you see the edges of teh 2d plane in blender? 23:52 Anonyma Ah, so it's the size of an ingame block. 23:52 Anonyma Then a player model would be roughly 1.8 of those, right? 23:53 Anonyma Well thank you, you've been a super help! 23:54 Jordach which means when pulling faces, extruding them etc, they'll keep to those "pixels"
23:54 Hijiri does an immortal=1 entity still get removed if it's health is at 0? 23:55 Hijiri what if you do set_hp(0) ? 23:59 Jordach my client might be like 0.4.? ?